Chocolate chip cookies are best when baked in one’s kitchen, in a home with adequate airflow—the aromas permeating the farthest rooms are as much a draw as the cookies’ edible pleasures. But sometimes this isn’t an option. It’s 9:30 p.m., you’re jonesing for chocolate chip and making-from-scratch isn’t feasible. That cute little bakery closed at 3 p.m. Your neighborhood supermarket is the only fix. Store-bought chocolate chip cookies aren’t ideal, but neither is frozen pizza. Both are convenient, consistent, and scratch their respective itches. With Chocolate Chip Cookie Week ongoing, The Takeout was more than willing to suss out the merely serviceable from the quite good. Tasting notes: With chocolate chip cookies you generally taste the cookie separate from the chocolate. For some reason this one tasted very one-note—the very sweet chocolate blending into the very sweet base cookie. You can taste the salt in this, too. Tasting notes: This one looks the most homemade, the type of flattened, slightly over-baked cookie you bring to share with your office colleagues. The flavors are quite good, with butter most prominent. It’s baked dark and tastes like it too, with an appealing toastiness to each cookie. Tasting notes: Perhaps we’ve been spoiled by so many cookies, because these resemble breakfast cereal cookies. There’s even a corn cereal-savoriness to these cookies, which is to say, they lack the luxurious butteriness that others have. They’re crunchy without being crumbly, and we appreciate the mini size for portion-control reasons. Tasting notes: Advertising itself as “soft-baked cookies,” these were indeed the softest of the bunch, a cookie that doesn’t provide much resistance to one’s teeth. Some taste-testers loved its moist and chewy nature, but for me, it tastes like it’s not fully baked. Texture is the draw: If you enjoy a cookie with a pillowy texture, this is for you. Flavor-wise, there are better options. Tasting notes: Something tastes off. Among the quotes from taste-testers, “Is this gluten-free?” “When I say I want a chocolate chip cookie, this isn’t it.” “Tastes like an oatmeal cookie masquerading as chocolate chip.” That last observation was on point: There’s a nuttiness (without any nuts) and an earthiness to this cookie, which someone else described as “an over-dried scone.” The chocolate chunks also appear minuscule compared to other cookies. Tasting notes: Lots of textural variance with the abundance of chocolate chips. This is the type of cookie that withstands a dunk in milk. The base cookie has a predominance of vanilla flavor. Tasting notes: Tastes dialed-down compared to its “Chunky” brand. Crisp but not crunchy. The prevailing comment is that this is a “fairly standard” cookie—nothing remarkable nor offensive. It tastes exactly what you’d expect supermarket-bought chocolate chip cookies to taste like. Tasting notes: Exceptionally crispy, yet feels rich from the butter flavor. The cookies leave a milky, butterscotch note. Chocolate chips appear melted and integrated into the cookie, so you’re losing out on the chunky texture. But a very good cookie nonetheless. Tasting notes: On the drier and crumbly spectrum, but offset by lots of chocolate chunks and a good butteriness. 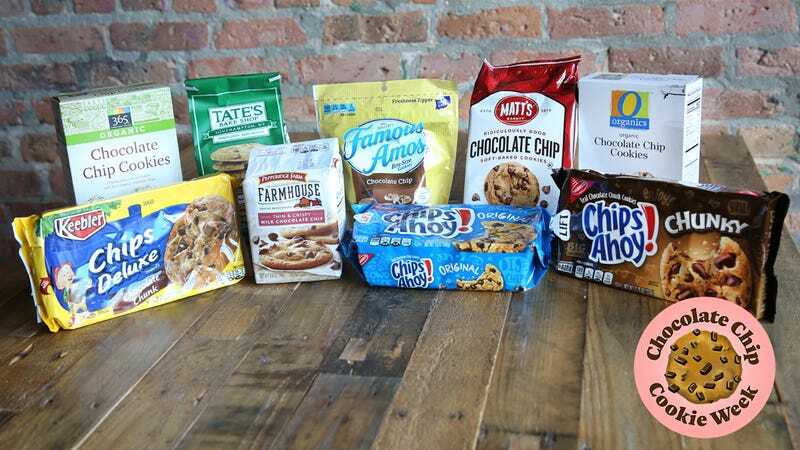 The two favorites in our blind taste test were Pepperidge Farm and Tate’s Bake Shop. Both offered similar cookies: Thin, crisp, with a rich buttery flavor to the base cookie. In the end, slightly more people preferred the Pepperidge Farm cookies. And so we anoint Pepperidge Farm Farmhouse’s “Thin & Crispy Milk Chocolate Chip” as our supermarket cookie champions of 2018.